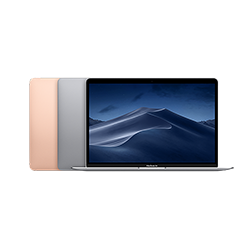 Available in silver, space gray, and gold, the new thinner and lighter MacBook Air features a stunning Retina display, Touch ID, the latest Apple-designed keyboard, and a Force Touch trackpad-all housed in an iconic wedge design made from 100 percent recycled aluminum. And with all-day battery life, MacBook Air is your perfectly portable, do-it-all notebook. A signature confirmation will be required upon order delivery. Due to shipping regulations for products containing Lithium Ion batteries, this product can only be shipped within the contiguous United States via UPS Ground shipping, and is not eligible for expedited shipping.